If you’ve ever struggled to imagine how life will change over the next century thanks to technology, take comfort — you’re not alone. 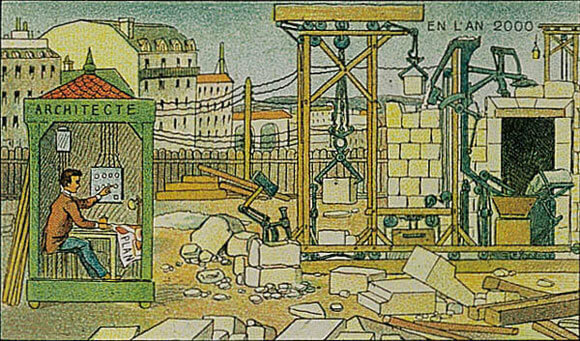 Over 100 year ago, some French artists tried to do the same thing. 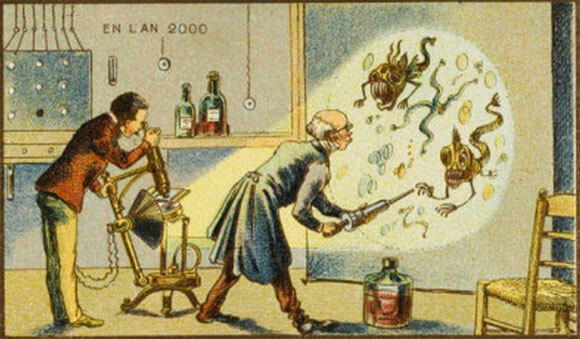 During that time, one of the most influential science fiction writers ever had been busy letting his imagination run wild with all the possibilities that the age of science was opening up. 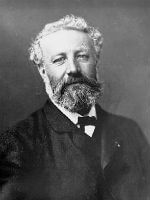 That writer was Jules Verne, whose collection called Voyages Extraordinaires contained 55 novels, including the well known “20,000 Leagues Under The Sea” and “Around The World In 80 Days”. He even wrote a short work imagining what life would be like a millennium in the future called In The Year 2889. 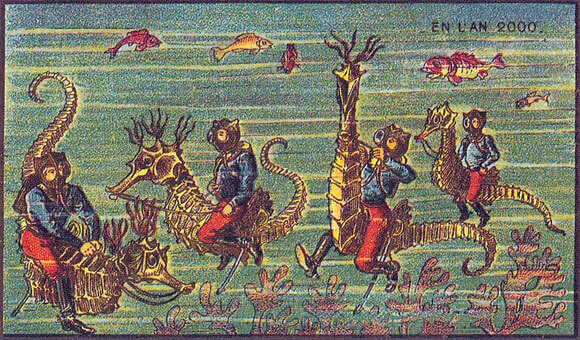 Verne’s stories were popular among the French, and their imagination swooned with the endless possibilities of the future. 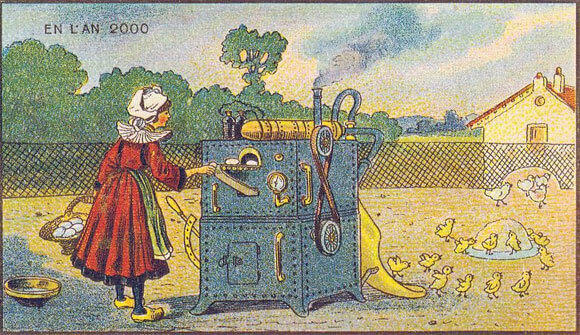 Starting in 1899, a commercial artist named Jean-Marc Côté and other artists were hired by a toy or cigarette manufacturer to create a series of picture cards as inserts, according to Matt Noval who writes for the Smithsonian magazine. 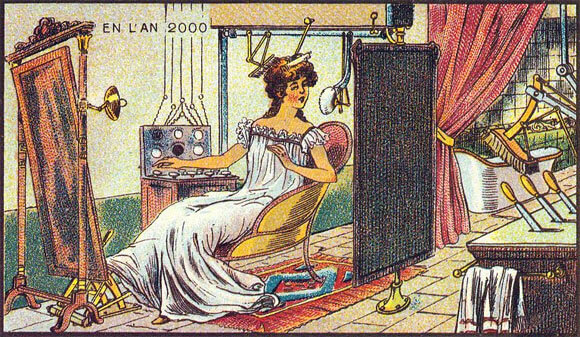 The images were to depict how life in France would look in a century’s time, no doubt heavily influenced by Verne’s writings. Sadly, they were never actually distributed. 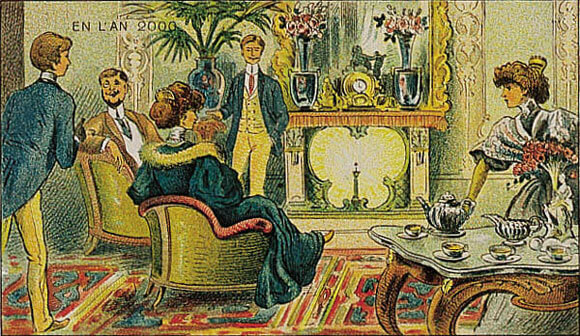 However, the only known set of cards to exist was discovered by Isaac Asimov, who wrote a book in 1986 called “Futuredays” in which he presented the illustrations with commentary. What’s amazing about this collection is how close their predictions were in a lot of cases, and how others are close at hand. 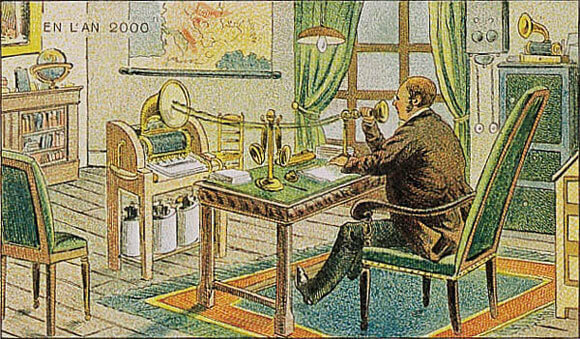 But the scope of using machines to do work wasn’t seen to be limited to smaller scale activities. Why not use machines to allow a single person to construct buildings? We aren’t there yet, but recent advances in 3D printing almost beg for houses and other buildings to be printed out, if the technology could be worked out. 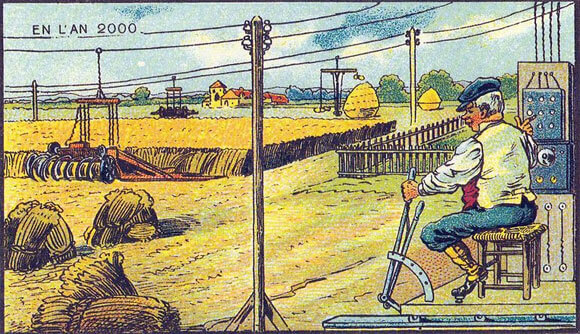 The artists also imagined how robots would have an even bigger impact on society, as in helping farmers plow fields. Robots on farms are on the rise, as bots have been developed to milk cows, pick only ripe strawberries, and even kill weeds. 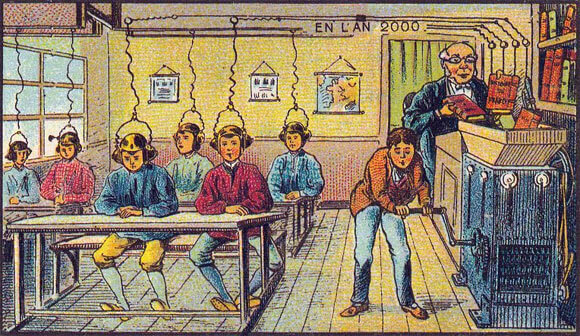 The possibilities of science must have seemed endless, and technologies that would fundamentally change society would seem all but likely, as in one illustration that shows books being ground up and fed directly into the ears of schoolchildren. While it may seem a bit to Matrix-like to become a reality, one could argue that this is fundamentally what an audiobook is or what the Internet does with information. We may not be at the point where information is fed directly into our brains, but reality isn’t that far off. 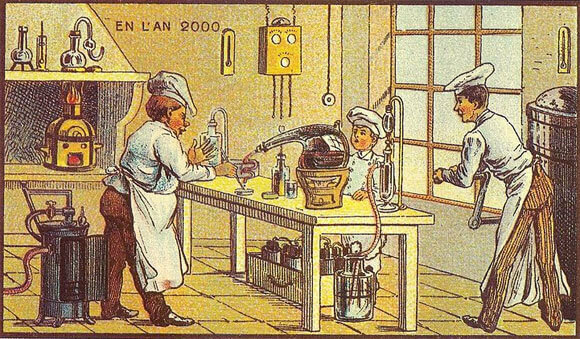 In what some French people might consider an abomination, one illustration depicted the modern kitchen as a place of food science. While synthetic food in commercial products is sadly more common today than we’d like to admit (sorry Easy Cheese lovers, but I’m calling you out), the rise of molecular gastronomy in fine dining has made food chemistry a modern reality. It may seem like food science has its limitations, but one only needs to consider efforts to grow meat in a laboratory to see how far technology may go. 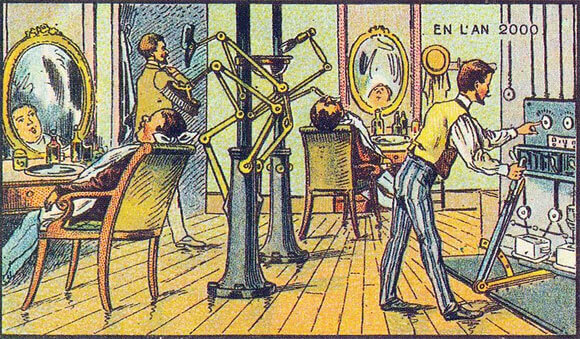 As incredible as it is that Côté, Villemard, and others were able to envision some of our modern technologies, one would expect more misses than hits. 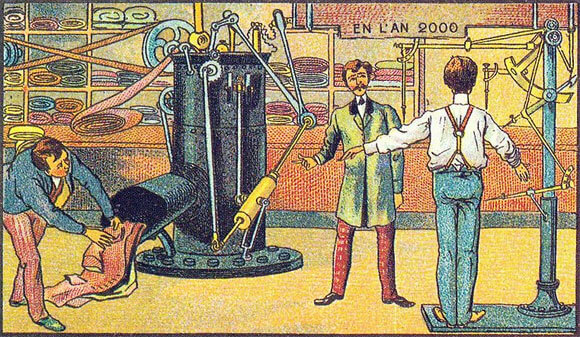 They are, after all, making fantastical predictions about technological progress over a century’s time, and it’s challenging to be accurate (unless you are Ray Kurzweil). 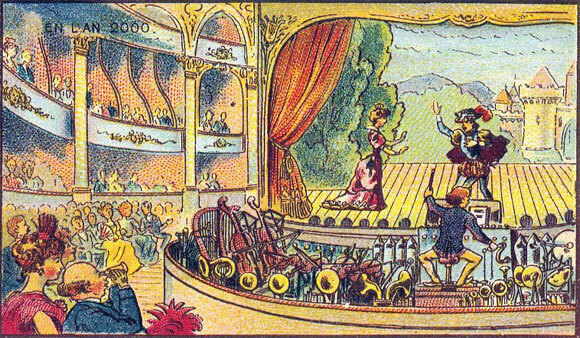 Making predictions in the shadow of Verne’s body of work, one would take for granted that the sea and the air would be open to all. For instance, the artists were fascinated by the possibilities of flight. 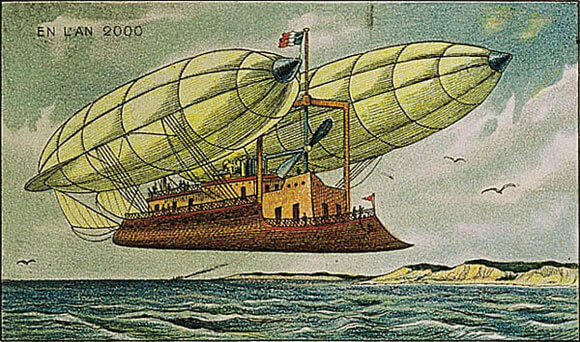 This makes sense, considering that powered gliders were in development during the 1890s, the first Zeppelin was being constructed in 1900, and the Wright brothers made their historic flight in 1903. 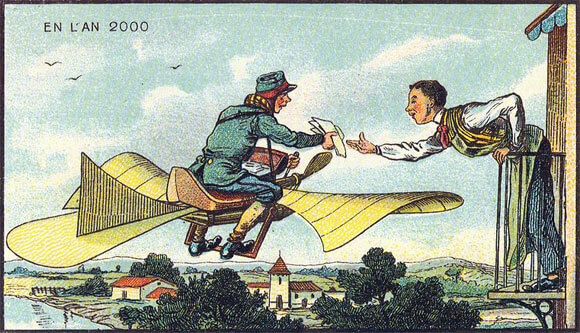 But personal flight was envisioned to be much more integrated into daily life, envisioning that wings would help people do all sorts of things like delivering mail…physics be damned! 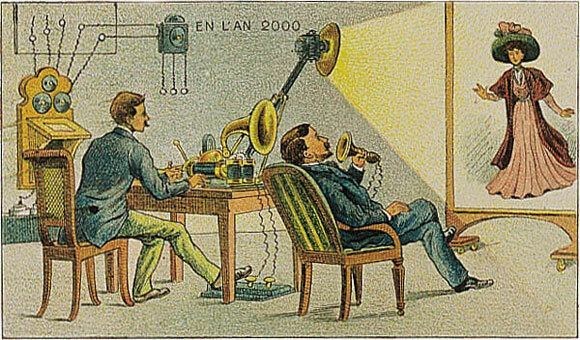 Imagining the future is vital to progress, as it means technological advances are the result of deliberate efforts to make ideas reality, rather than simply humans reacting to their surroundings like animals. 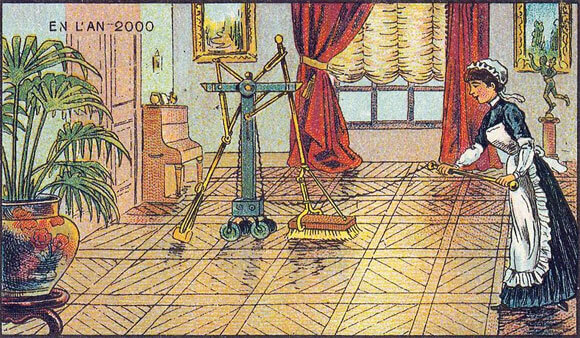 These illustrations are a testament to a handful of very creative artists who tried to bring a vision of the future to the masses. How unfortunate that the people of the time never got to seem them.